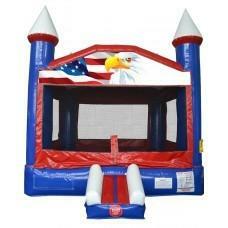 The Patriotic Red, White & Blue Bounce House is great for a birthday party, 4th of July party, county fair or any event where you want to show off your American Pride. This inflatable will provide hours of jumping fun for kids and adults alike. The 3 foot ramp allows for easy entrances and exits.